The Lexus LX is about to make a serious splash: a diesel will be added to the line-up for the first time in 20 years. Picture: Supplied. LEXUS has finally answered the prayers of its well-heeled four-wheel-drive fans who've been demanding a diesel for two decades. Lexus is poised to introduce a diesel-powered version of its flagship LX 4WD that will sell alongside the LX570 petrol V8. The Lexus LX450 will be powered by the twin turbo 4.5-litre V8 diesel found under the bonnet of the Toyota LandCruiser, with the same output - an epic 200kW of power and 650Nm of torque - and 3500kg towing capacity. Although photos are yet to be released, the diesel version will look identical to the LX570 except for exterior badges. 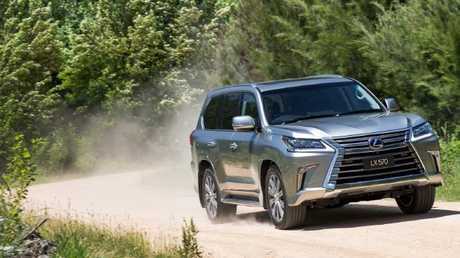 Lexus LX owners will soon be able to get further off the beaten track with the driving range of a diesel, which slashes fuel consumption by one-third. Picture: Supplied. Lexus engineers are said to have gone to extreme lengths to suppress engine noise and make the diesel as quiet and refined as the petrol V8. The only items missing from the LX450 - for now - will be the sunroof, chilled centre console, Mark Levinson audio, and third row of seats, making it a five-seater only initially. Because the Lexus has so much extra equipment over and above the 2.7-tonne LandCruiser, Toyota engineers wanted to trim some weight from the LX450 to bring it into parity. However, it's believed these deleted items will be reintroduced on the LX450 once further engineering work is completed. 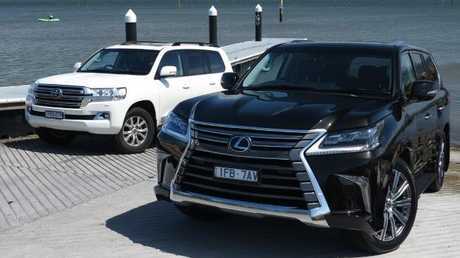 Lexus declined to comment on the imminent arrival of the LX450 however well placed sources told News Corp Australia it is due in showrooms mid April. 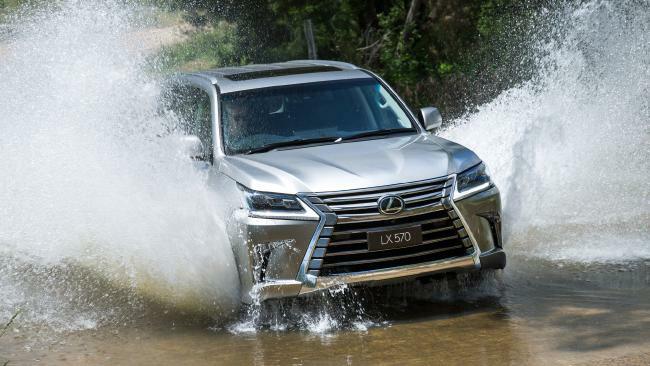 The other sweetener for Lexus 4WD fans: although price is yet to be confirmed News Corp has been told it will be close to $147,000 drive-away, about $8000 less than the LX570's drive-away price. 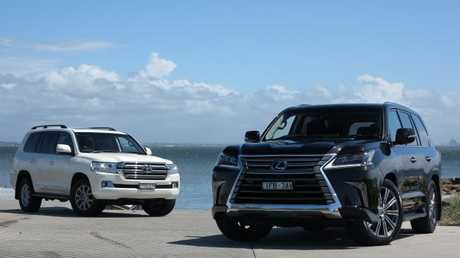 Twins under the skin: the Toyota LandCruiser (left) and Lexus LX570 (right). Picture: Joshua Dowling. Lexus has been selling on average fewer than 300 LX570 4WDs a year over the past four years - but the addition of the LX450 is expected to boost sales, given the overwhelming majority of the luxury 4WD market is diesel. The LX450 will get the latest version of the twin turbo 4.5-litre V8 diesel; in 2015 it got a 5kW power bump, to 200kW, due to new injectors, while torque remained at 650Nm. On the LandCruiser these changes trimmed fuel consumption by 7.7 per cent - to 9.5L/100km. Owners of the petrol V8 LX570 will notice the biggest difference if they update to the diesel: consumption will be slashed by almost one-third, from 14.4L/100km to 9.5L/100km. Lexus LX buyers will soon have the choice of diesel power borrowed from the legendary LandCruiser (left). It will be cheaper to buy and cheaper to run. Picture: Joshua Dowling.